Most of the questions I am asked about, by expecting mothers, are regarding at home newborn photos. New moms have many questions about things like the size of their home, the light in their home, the cleanliness of their home and overall how images taken in their home compare to studio photos. Answering these types of questions are always important to me. My goal is to make mom as comfortable as possible, because if mom is comfortable, baby will be too. So today I wanted to share a bit more information about at home newborn photos and why I think they are the way to go for most new moms. First, let’s talk about the size of your home, that really doesn’t matter to me. You see I only need a very small amount of space to create my working area. Often times I don’t even have to move furniture to make it work. Second, is lighting or windows. I love natural light. If your home is blessed with loads of beautiful windows, you can bet I will be using them. However, if it’s not and your house tends to be a bit darker, no worries. 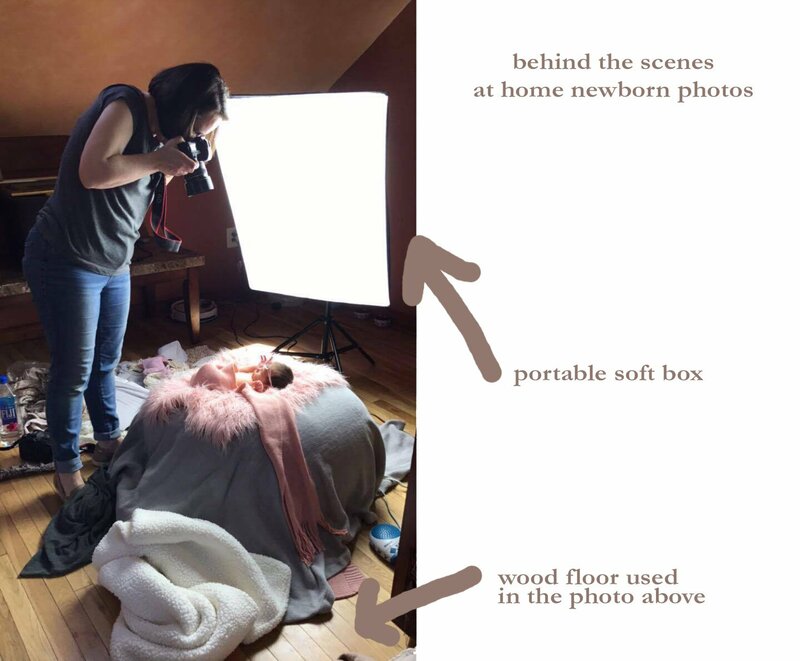 I have a portable soft box that I bring to all my at home newborn photos. It is small and light weight and perfect to get the job done. Third, is cleaning your house. Listen, I was a new mom once too, so I know the last thing you want to spend time doing is cleaning your house before your session. Please, I beg you, don’t worry about it. I promise I won’t even notice it and it will not show in your pictures. Trust me! 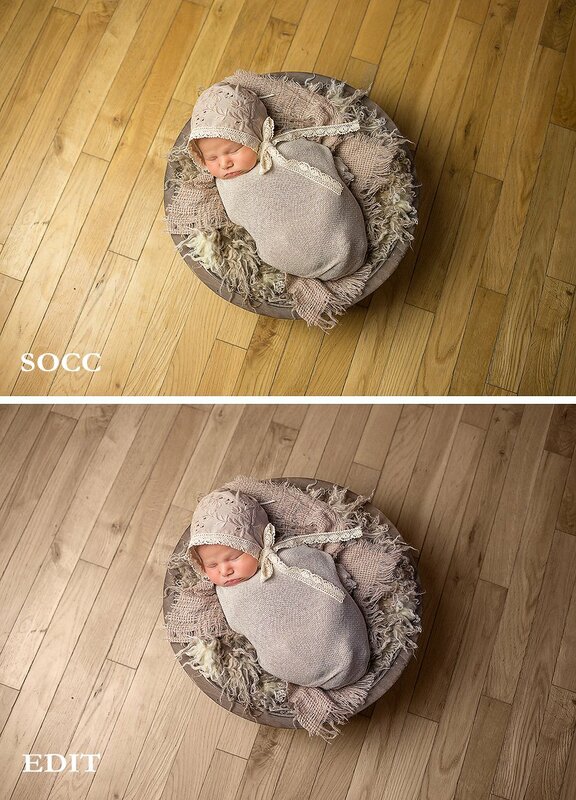 And fourth, will your at home newborn photos look like studio images? You bet they will! Take a look at the image below as an example. I had brought the bowl, fabric and hat for baby to wear and had a whole vision in my mind how I would set it up. When I arrived and saw wood floors, I knew I was in luck. Now the floors were wood but they weren’t the color I had in mind. What’s a girl to do right? That is where the wonders of Photoshop come in. As you can see, I brought the image into Photoshop and changed the floor color to look exactly like what I had in mind. And voila, this image looks just like it was created in a studio. As you can see, at home newborn photos, offer the same quality images as studio photos but with the comfort of being in your own home with everything you need for you and baby. Here are a few more examples of at home newborn photo sessions. Hopefully this article was helpful in answering some of your questions or concerns about at home newborn photos. If you still have more questions or would just like more information about scheduling a photo session for your baby, click here. NEXT Learn to use your camera!